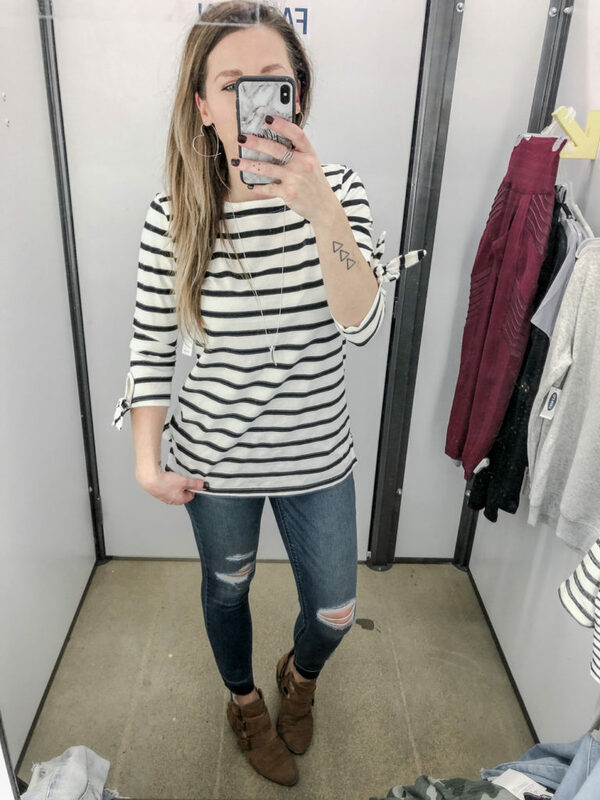 This week I’m bringing you the Fitting Room Diaries at Old Navy for two reasons: ONE bc its always the most requested by my Instagram followers and TWO bc its Super Cash Time which means you can get ALL the clothes on the cheap if you’ve earned Super Cash and if not, they’re always having some sort of sale SO YEAH, Old Navy it is! 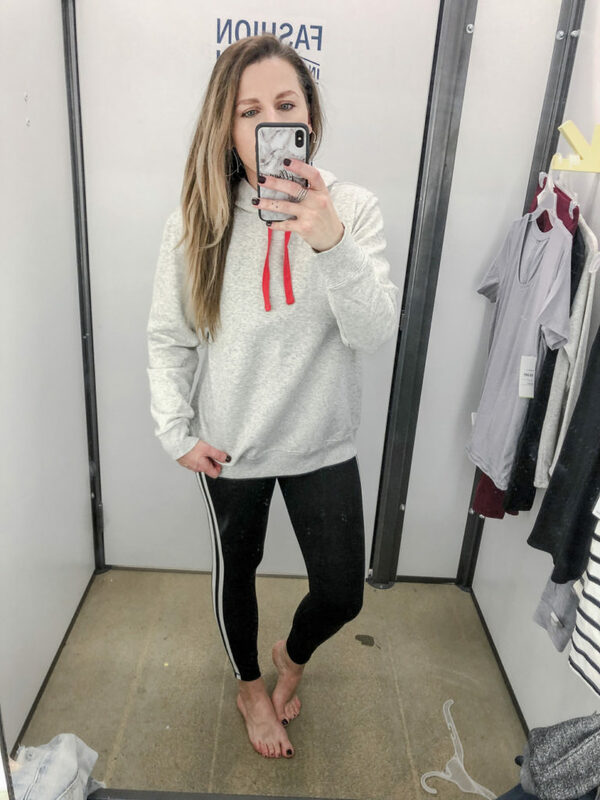 As always, I grabbed lots of stripes and neutrals, but also included some athleisure looks bc I’m really feelin’ the athleisure vibes lately like you saw in this roundup! I’d also like to thank you all in advance for shopping thru my links in this blog post and on my Shop My Instagram page! I do make a small commission thru your purchases (at no cost to you!) and it helps keep this blog moving as well as small payment for the work that goes into these Fitting Room Diaries! You may not realize it, but it takes hours of work to get one of these together, so THANK YOU! Its also really easy to always find what I’m wearing by downloading the LiketoKNOW.it App and following me on there! You can even create a wishlist so you’re not going broke shopping! 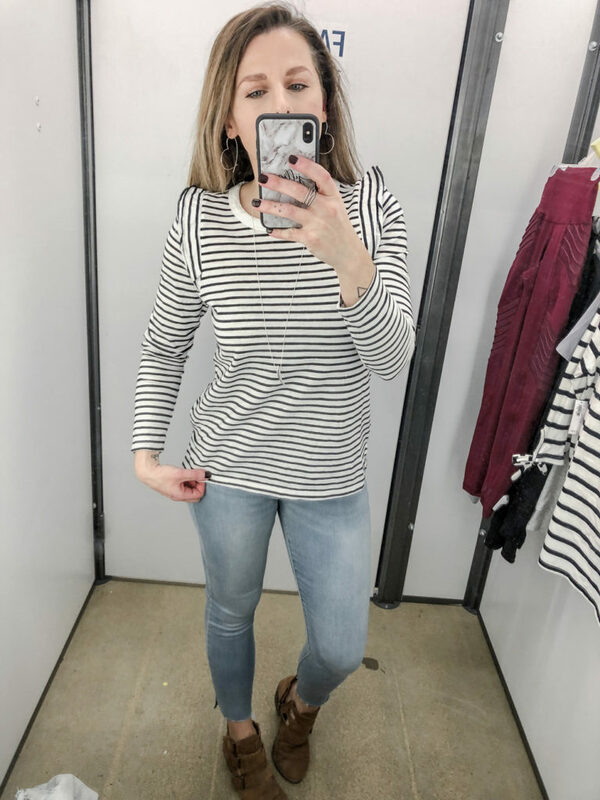 This is the first of three striped tops I tried on. There were more, but let’s be reasonable, ok?  This one is a textured fabric and the black stripes are not solid in color. I like the fact that its more of a substantial material – not too thick, but not flimsy either and its breathable! I went with a Small in this top and it fits well but still has room in it. If you’re over black and white stripes, first I question your sanity BUT this always comes in a few other colors of stripes and solids as well. Moral of the Story: This top is a must buy! I grabbed these ripped black skinnies bc duh! The high-waisted rockstar skinnies are always a good grab and have a decent amount of stretch to them. I’m wearing a 2 in these jeans per usual. Only gripe? The knee slit in these jeans hit above my knee so it was a little awkward but maybe I just have long thighs?? Haha, who knows! I’m usually not one for cutesy details but how can you resist these cute little tie-sleeves?!! Just kinda loving these and pondering who I am as a person anymore… I mean, I wore pink pj pants yesterday. Anyways, this top is adorable, it comes in a few color ways of stripes and polka dots too! I’m wearing my usual Small in this top as well and the fit is perfect. Not tight, but not baggy either. 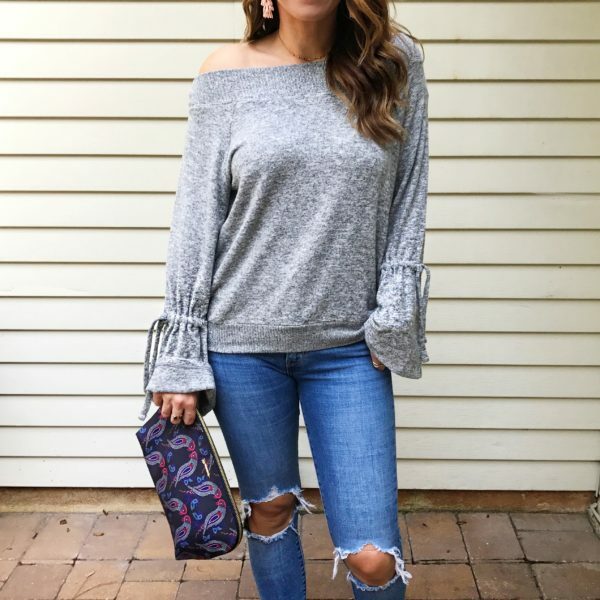 I grabbed yet another distressed pair of jeans with this look and I was loving the hem of these, aren’t they different? I’m wearing a 2 in this pair as well and like the previous pair, the slits just hit at weird spots on my legs – I don’t get it? Otherwise, super duper cute and unless you are a long-thighed gal like me (is that a thing?? ), these are a great pair of distressed jeans to add to your closet! Ok the last of the striped tees (for today) and this might be my favorite. I know I said I’m not usually into cutesy details, but I don’t include ruffles in that statement, sorry! I love a good ruffle so I practically lunged for this top! I mean, HOW.STINKIN.CUTE.?!! It comes in two striped variations and two solid colors and its just a YES for me! I did grab a Medium in this top as its a more fitted silhouette so definitely size up if you aren’t down with fitted looks! These jeans may appear to be your usual rockstar jeans, but they are not! Ok, so its been awfully cold this past week or so – its like 60 degrees as I type this but NJ weather is bipolar so let’s just remember that coldness that will be back this time next week, k? well these jeans are lined and keep your legs SO warm! Plus of this is that they’re not like weirdly thick – I don’t know what kind of voodoo material ON used on these, but they’re warm without bulking you up! I wore my usual 2 in these jeans and they fit perfectly! Like I just mentioned in my random weather rant above, the weather is unpredictable this time of year and as we move into March and April. Its freezing one second, sweltering the next and you’re just standing there like WHAT THE HECK. 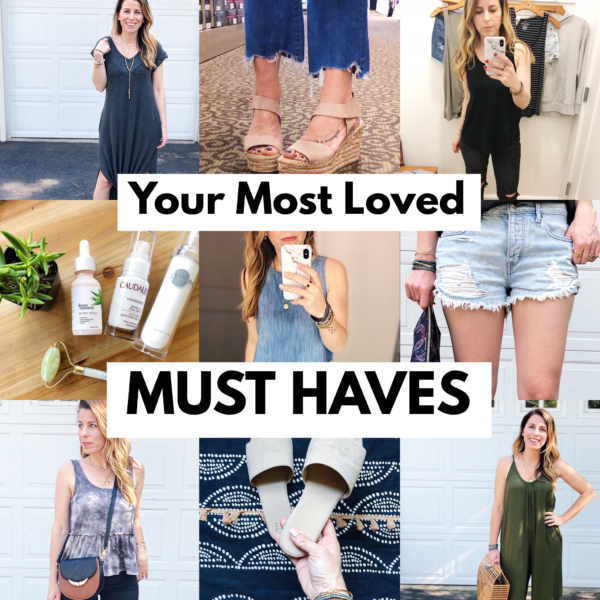 So these next few looks will take you through all the temps while still looking cute! 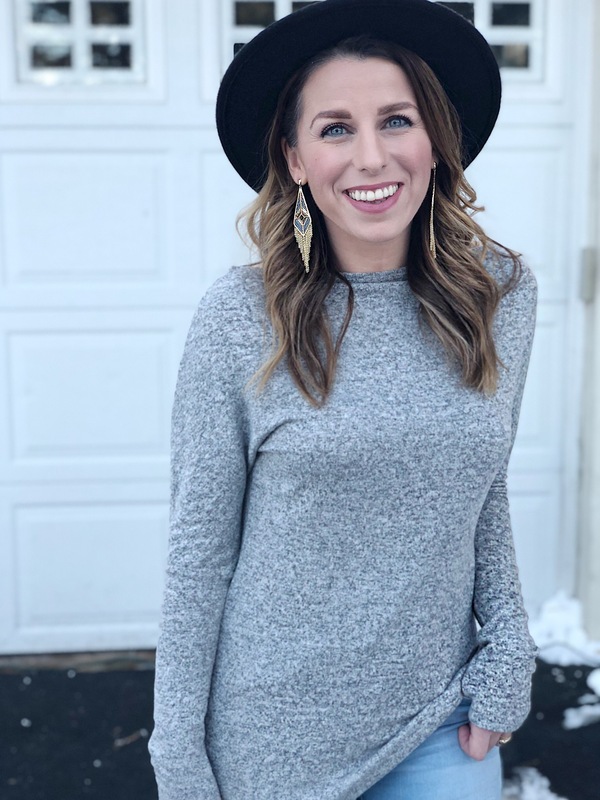 I love a good cardigan especially the big cozy ones in the winter HOWEVER as temps rise a little, you will suffocate in those so a lightweight version is very necessary for your wardrobe. 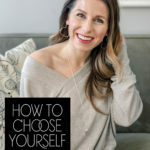 I love having a gray one of these on hand as you can throw it over pretty much any outfit – even a total greige look! 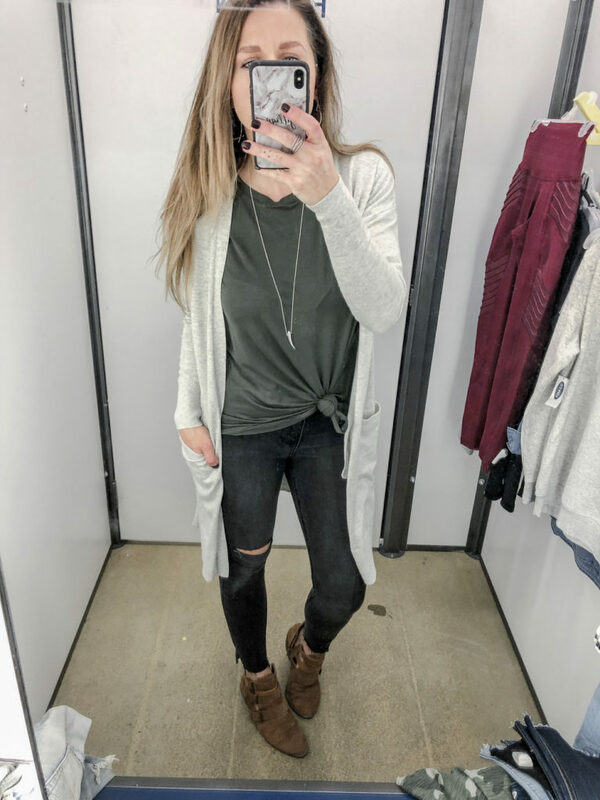 So this cardigan + one of these luxe tees + ripped skinnies works so easily (its one of my go-to outfit formulas!) and if it heats up throughout the day, just pop the cardigan off! I tied the tee to add some definition in my middle for when I added the cardigan, but you could wear it loose as well! 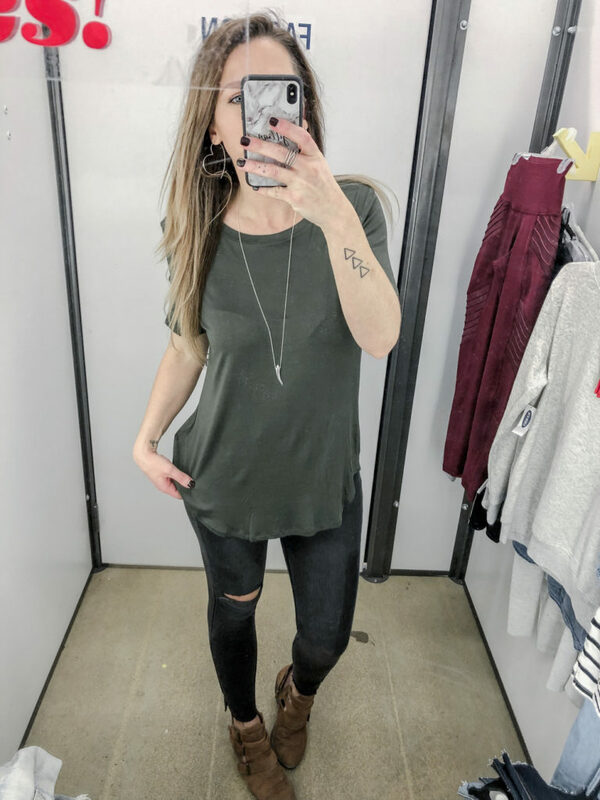 I grabbed a Medium in this luxe tee for a looser fit and so I could knot it. I’m a huge fan of knotting tees! This tee comes in five different colors and its a great basic to stock up on! I’m wearing a Small in the cardigan and it also comes in a darker gray option as well. The jeans are a 2 per usual. 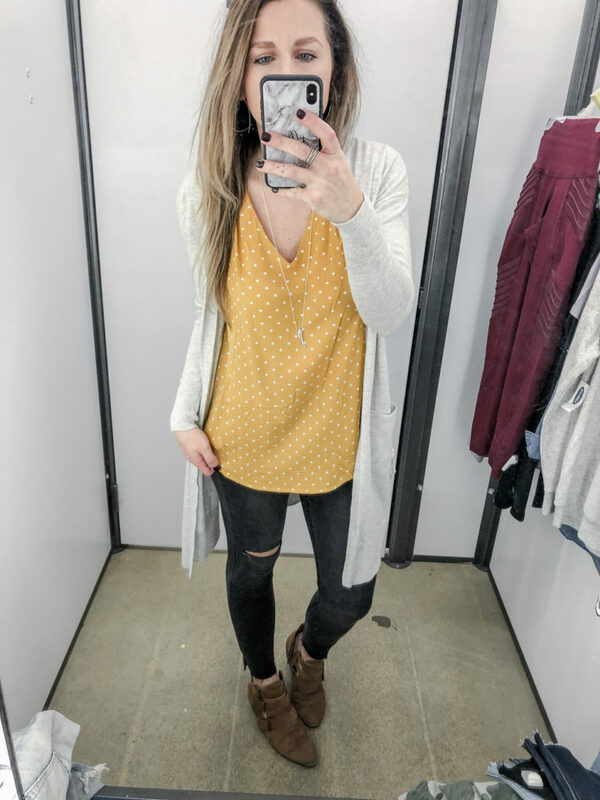 For this look, I switched out the olive luxe tee for this yellow polka dot tank for a little pop of color! I know, who am I really? This tank is supercute though and comes in three spring prints. I’m wearing a Small in this tank and have plenty of room in it – it would also look cute tucked in! 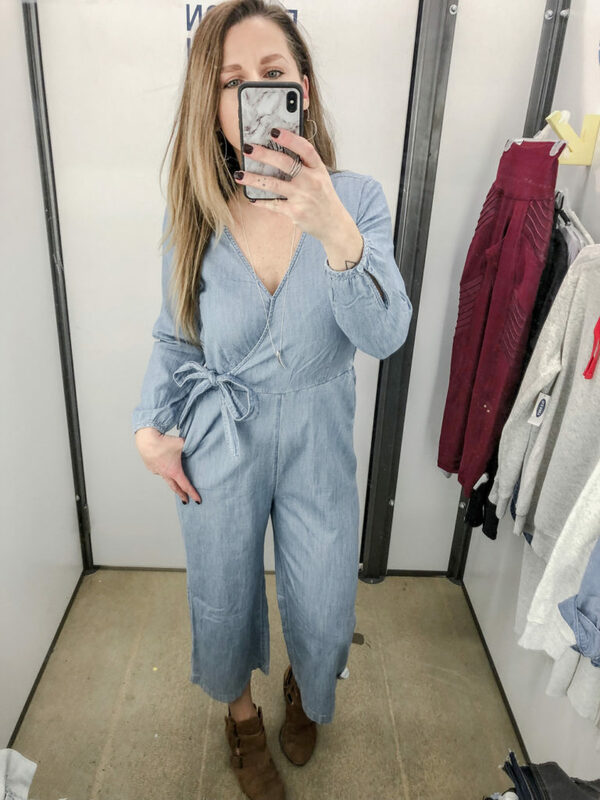 If you’ve been following me for awhile, you know its not a Fitting Room Diaries if there isn’t a jumpsuit in the line up! What can I say? This gal LOVES a jumpsuit! I don’t wear dresses in the colder weather often bc I’m freezing and nobody wants to see my pale legs so jumpsuits are always a win! This chambray version is giving me ALL the heart eyes! I love its faux-wrap look, there’s a modesty snap at the bust to keep the girls in and its still on trend with its wide legs! I would rock this with some sock boots and a moto jacket when its cold out and on it own with some cute mules for warmer temps! If this jumpsuit is wrong, I don’t want to be right! I’m wearing an XS in this jumpsuit and the fit is perfect. Ok, athleisure is clearly having a moment lately! 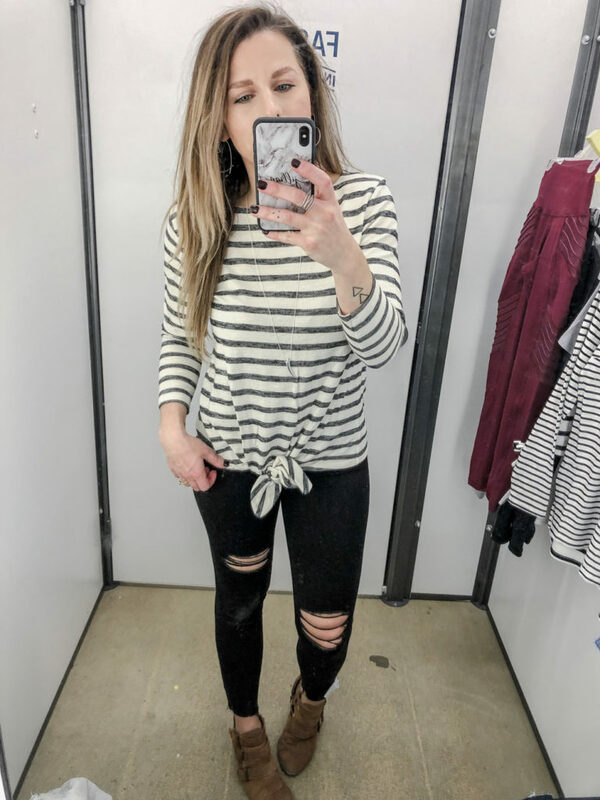 All of my favorite bloggers are wearing it and I finally dove in recently with the addition of some dad sneakers and some good faux leather leggings! So why mess with a good, comfortable thing, right? 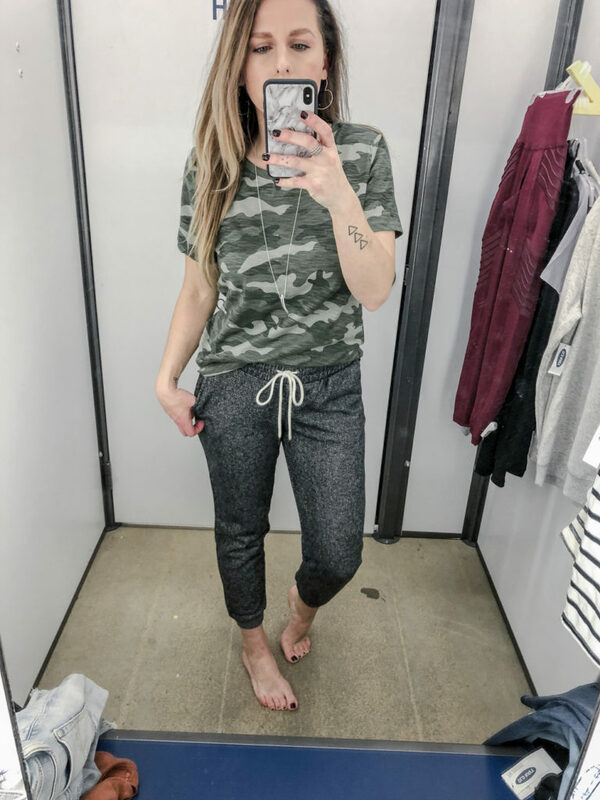 I actually bought this camo tee this past year (worn here) and it sold out super fast so I was excited to see it back in store (and under $15!). I grabbed a Medium in this tee for a looser fit and yeah, you just need it k? Now branching out some more for me brings me to joggers. I can rock leggings, especially faux leather leggings, but joggers are a stretch for me. I’m just not a sweatpants in public kinda gal, but they’re growing on me! These marled french terry joggers are crazy soft and cozy – they feel like pjs to be honest! I grabbed a Small in these joggers and had some room in them. They didn’t have an XS in store or else I probably would’ve sized down in these. The legs fit fine but they’re a little poofy in the frontal area. If you’re a curvy gal, I’d stick with your normal size though or else you run the risk of them being too tight. Now this look is more my speed. 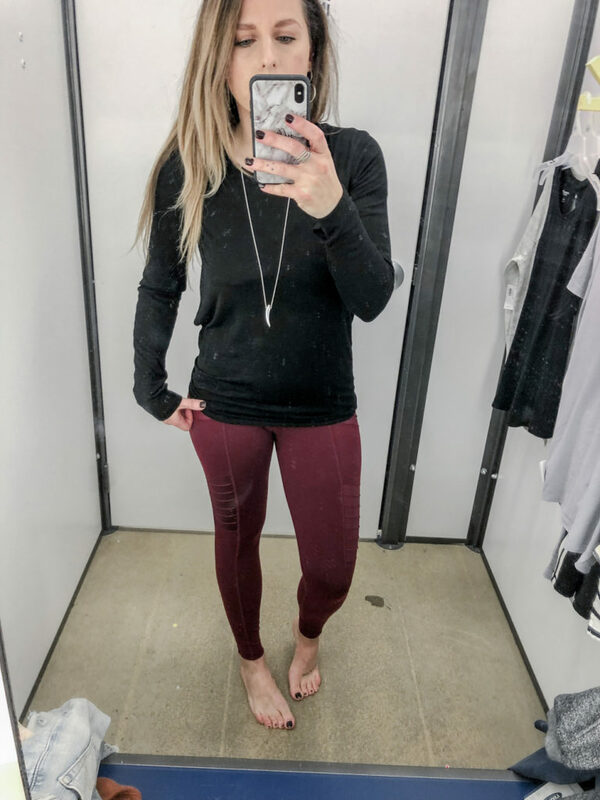 I love me some moto leggings and this red/burgundy color is so pretty! I love it paired with black, gray or white – obviously. The 7/8 leggings fit me better length-wise since I’m 5’3″ and I wear a Small in these leggings. High-waisted for the win! This top is SO cute, you’ve gotta go check out my Instastory today for the video to get the view of the back! It drapes and is just so sassy and fun. I grabbed a Small in this top and it fits perfectly! Also I’m wearing a gray/black sports bra under this and I usually have a hard time with sports bras if they’re not sized like bras. I’m a 34D so while I need a small for my around size, I need some room for the girls still so I’m always clueless as to what size to grab in these. Well, I thought I grabbed a small, at least that’s what the hanger said, but when I was hanging this one back up, I realized the bra was actually an XL. No wonder I had so much room in it, haha! Racing stripes are coming in hot but if they’re intimidating for you, why not try them on a pair of leggings for the gym? I’m usually much more adventurous when it comes to gym leggings than with anything else in my life so here ya go! I cannot find this exact pair online, so I’m linking up a similar side-stripe option. These are the 7/8 leggings again so no tucking them under necessary for us shorties and I’m wearing a Small in this pair. This tee is super cute too btw. Actually, they have a bunch of cute tees for your workouts right now. I just love the tie back of this one! It comes in a few colors and I’m wearing a Small in this top. Same look, just threw this supercute hoodie on top! This one comes in quite a few colors, is super soft and I’m wearing a Medium in this sweatshirt for a looser fit! Definitely a must-grab hoodie for winter through spring! For my last look, joggers again! This pair is SUPER lightweight and breathable! They come in a few colors and these are perfect for hot yoga, a long run, etc! I would recommend sizing down in these bc they are really big in the waist. So unless you want a really baggy “upper area,” SIZE DOWN! I’m wearing a Small and definitely need an XS in these joggers. This tank on the other hand, SO FREAKIN CUTE! It crosses and ties in the back and I am just loving it! Again, go check out my Instastory today so you can get a peek at the back of it! It comes in a few colors and I’m wearing a Small in this tank! 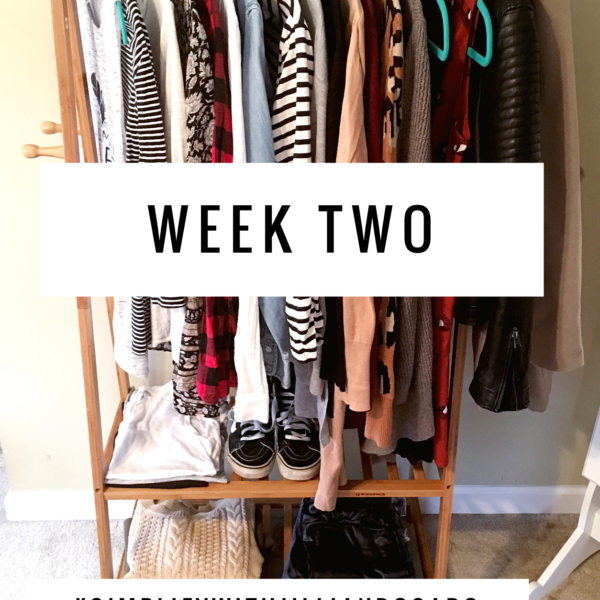 So that’s this week’s Fitting Room Diaries at Old Navy! Be sure to cash in that Super Cash before it expires and if you don’t have any, you can use code SWEET for 20% off your purchase! 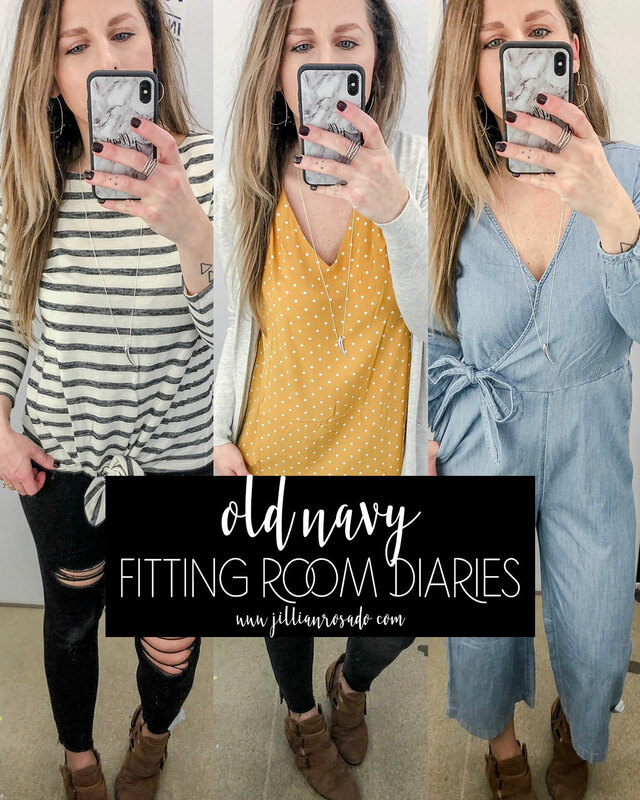 Pro Tip: Shop Old Navy online! They ALWAYS have a better deal online and if you don’t want to pay shipping or wait for your order to arrive, choose the Pick Up In Store option so you get the savings from shopping online! 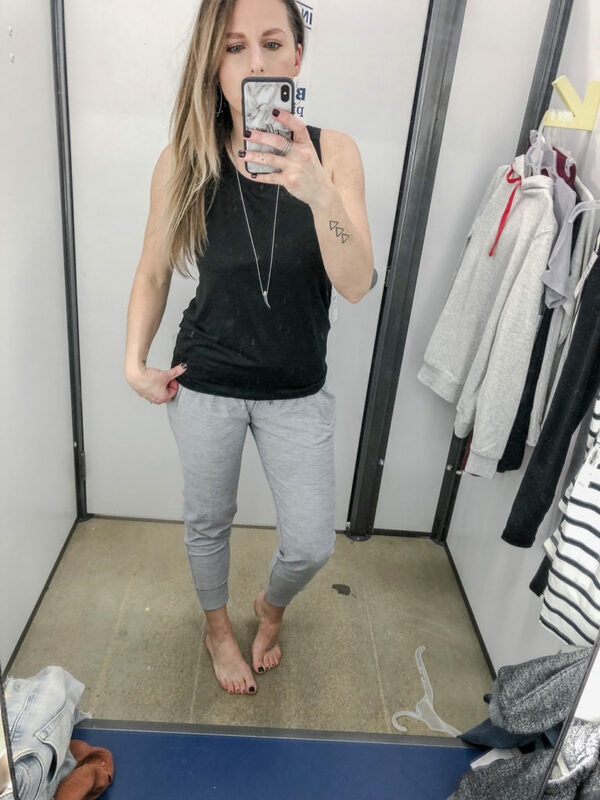 Be sure to subscribe to my blog HERE, so you never miss my weekly Fitting Room Diaries posts and everything else I’m sharing over here! 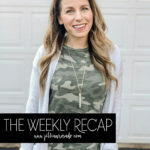 Also be sure to sign up for my Weekly Newsletter where I round up everything you’ve missed throughout the week along with the Top 5 Purchases from my followers and an inside peek at my life! You can sign up for it HERE!